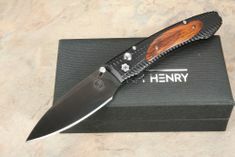 William Henry EDC E6 Knife Series continues in the functional style of the William Henry line. Each handle is machined from solid aircraft grade aluminum alloy, then hard anodized to rigid military specs for a lifetime of exemplary service. A synthetic diamond-like coating is bonded to the blade on a molecular level to keep it tough enough for any application. 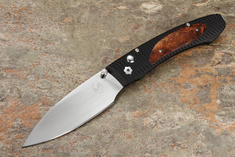 Each blade in the William Henry EDC E6 Knife Series is crafted from the M390 blade steel. This exceptional metal can obtain and keep a razor sharp edge. Every last blade is precision machined then hand finished to a quality that has become an expected trait of all William Henry's work. Adhering to the strictest standards, each inlay is hand finished to add a warm offset to the hard perfection of their 3D machine textured handles. The EDC line incorporates William Henry's button lock system for the ultimate in safe one hand operation. Every knife has a serial number engraved on the blade just below the logo and comes with our own special certificate of authenticity.